A major accolade for the 2015 World Orienteering championships that took place in Nairn and Moray. Below is a tweet from the event ceremony in Glasgow. "I know that there was a good response from the people of Nairn. Incredibly, we won. 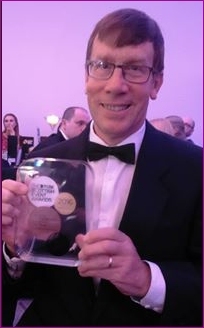 Colin Matheson, Scottish Orienteering's Events Manager (who lives in Nairn) was at the Radisson Hotel in Glasgow on Wednesday night to receive the award at the Scottish Event Awards. Scottish Orienteering would like to thank all local people who voted for the event in this prestigious award, both for the sport of orienteering and for the Moray/Nairn area." And what a fantastic event it was too to see all the competitors with their team flags shining in the Links sunshine - pictures of the event here on the Gurn Flickr Pages.